Our synchronous motors and generators provide outstanding performance and reliability. 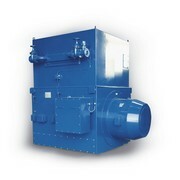 These AC synchronous machines are the preferred choice on large compressor and vertical pump applications. They are also widely used for wind tunnel fans and cycloconverter applications. Nidec ASI has consolidated experience in generators coupled to diesel engines and turbines of all types. These generators are specifically designed with all the construction features to withstand the pulsating torque generated by a diesel engine to ensure smooth parallel operation.